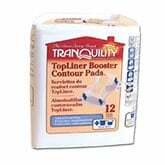 You are buying the Tranquility Topliner Booster Contour 15"x20" 3096CA 1/Case, manufactured by Tranquility Incontinence Products. Tranquility is a leading manufacturer of incontinence products like briefs, underwear, liners, pads, and more. At ADW Diabetes, we offer a large selection of Tranquility products with superior service, excellent pricing, and expedited shipping options. Unique wider design of this pad effectively contains larger amounts of fluid and bowel incontinence. The flow-through top and back sheet allows the liner to fill to capacity then pass additional fluid to the host garment.